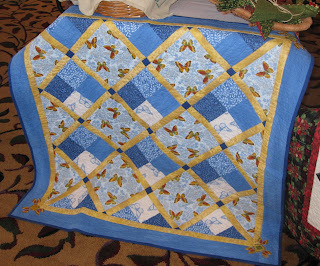 Hmmm... Winter is just around the corner, yet I still favor my spring quilts! My husband asked me why I haven't displayed this one at home yet... so I guess it will make its way to our dining room table soon. I fussy cut the butterfly wings and appliqued them on each corner, as flower petals. So cheerful!